I’m a big fan of the “brick-breaking” genre, ever since I first played the stock version that came on my dad’s tiny prepaid phone several years ago. Sure it’s really simple and stupid (bounce ball to break bricks. Win. ), but it’s also really fun. So, having not played a brick-breaker in a few years, Monkey Slam seemed like an interesting pick. But where a real brick-breaker is fun in its static simplicity, Monkey Slam fails in its overwhelming setup and annoying money-grabs. 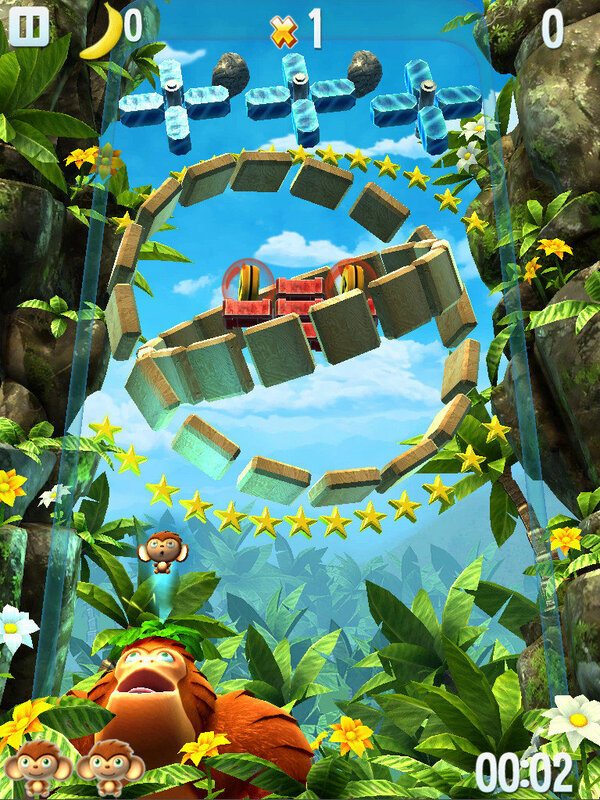 In place of the paddle, you control a monkey (Ape) with a leaf on its head, your “ball” is replaced with a Chimp, and the blocks are replaced with…well, blocks. And you get a series of worlds with a bunch of levels in each. So far, so good, right? It sounds like a traditional formula, but the mechanics quickly get messed up. 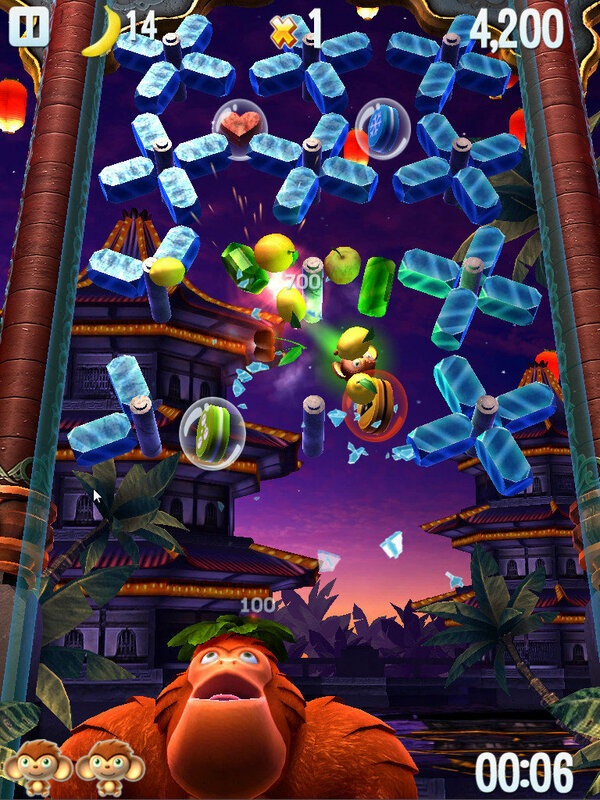 Basic stuff like the way the Chimp (ball) bounces gets irritating, especially in some levels where blocks are just above your head, so you have to lightning-fast bounce the monkey back until the first layer breaks. When obstacles or blocks fall, the Chimp will also bounce off of those, more often that not messing up your chance at winning. Not to mention that the way the leaf has to hit the Chimp for it to count as a bounce seems abnormally touchy. Yes, a game like this is supposed to be challenging, but it never felt challenging. Just cheap. The addition of powerups (two kinds: beneficial, or irritants) adds nothing really to the game, except unbalance. The beneficial ones (ones that freeze moving blocks or make your leaf wider) make the game too easy, and the irritants (make your leaf move back and forth without your control, or reverse the controls) turn the game into a rage-fest. And the best “powerup” (a bomb) is completely unbalanced, since it just randomly spawns on the map, and a quick tap on it clears the blocks around it, no charge. In the end, the powerups add nothing except a step away from the simplicity the game needed to succeed. And the obstacles are just plain infuriating, especially since you have to collect all of the “extras” with the leaf-wearing Ape. Not only do you have to bounce back the monkey, collect fruit that falls from broken blocks, collect gems, and collect powerups, but now you also have to dodge stuff! Some levels have so many obstacles it stops being a game and just becomes purely overwhelming, especially on certain stages where rocks just continually spawn and fall until the level ends. With bricks exploding, bombs appearing, obstacles falling, and multiple power-ups in effect, you’ll just want to quit. The game recognizes this, though, and offers you a way to eliminate the tough-as-diamonds moments…for a small fee, of course. Bananas (it is monkey themed. What did you expect?) are the “cure-all”. 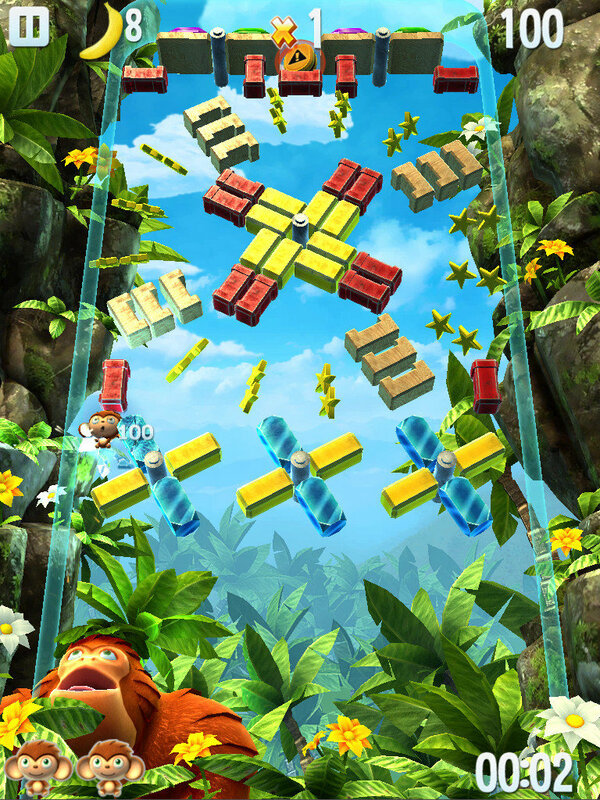 Within the first few levels, the game tells you that when the Chimp is in the air, you can tap in a direction to fire a banana towards a brick to break it without having the chimp hit it. I could already tell where this was going, and on the next level with the spiked tubular obstacles; I took a guess and chucked a banana at the falling menace. It exploded on contact, and with it, so did any hope of this game being good. Yes, not only can you destroy bricks with your bananas, but you can destroy most of the obstacles that bug you. Of course, you only get a few bananas upon completion of levels, so the game steps in and offers you more in the form of In-App Purchases (NOOOOOO!!!!). So now, not only can you unlock levels with cash (a staple in games nowadays, it seems) but you can also just destroy obstacles if you get overwhelmed (you will). I tried to see how long I could go without using them, but the temptation was just too great sometimes, and I found myself happily throwing one at the last block in a level, or destroying an all-too-close rock. You’ll get enough stock bananas to get the worst obstacles out of the way, so it never really gets impossible, but the fact remains that a game should never rely on power-ups. The claim that the game is “3D” are true as far as aesthetics go, but in gameplay implementation, it’s 2.5D and annoying. Let me explain. Since you play the game from a window perspective (like you’re “looking into” the game), when the game tries to manipulate blocks by moving them to the forefront and back, it is very hard to tell. And also, very hard to manipulate in your favor, since your Chimp will more often than not bounce on a series of blocks now in the background, and then pass underneath them a second later because they’ve moved to the foreground. Wow, it even sounds confusing on paper. And the music is nothing mentionable; the monkey cries, brick breaks, and powerup sounds are probably better just shut off. Hey, at least you can listen to your own music. “It’s just too much”, I realized. They turned something that shines in its simplicity into something over complicated and un-fun (it’s a word). And making the bananas such an important gameplay mechanic, even without the fact that they want you to IAP them, is just wrong. Don’t buy it, don’t play it.